Listen to Zandro Urbiztondo's "Cantilan". Pueblo de Bayuyo and Pueblo de Calagdan. The british stole these documents from the Philippine government during their occupation in1762. It is now on display at the British Library in London. Antonio Pigafetta's sketch of CALAGAN (or the present Calaghan, Calagdan or Calagda-an of Cantilan) in 1521. Important dates of Cantilan's foundation. 1782 - Cantilan became a regular parish under Fray Valero de San Agustin. The old town (top photo) is located along the shoreline of Calag-daan. It was populated by people from Bayuyo, Calagdan, Maslog, Ilihan and Panikian after Moro pirates attacked these places. The natives then called their new town Cantilang. October 14, 1856 - A hurricane from the north which turned over east and south increased to an intensity that tidal waves changed the whole town into a sea. On October 15, 1856, Cantilan became a wasteland. The survivors together with the parish priest Fray Modesto Marzo y Casabana then crossed the river and started to build the new Cantilan. 1914 photo of MSC priests. 1749 census: Bayuyo & Calagdan. 1896 Cedula of Jose Yparraguirre. Caraga is obviously named after the old, historic Caraga, an extensive landmass covering several provinces, in the northeastern seaboard of Mindanao whose existence outdated the arrival of the Spaniards in this country. The people of the old Calagan were originally from Ilihan (now Panikian), Calagan (now Calagda-an), Parasao (now Palasao) and Bayuyo (now Union, Manga and San Antonio). 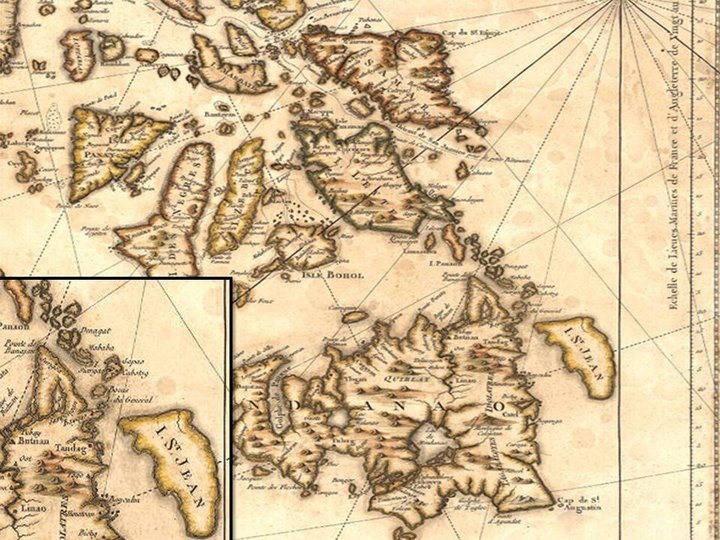 1521 - For the first time, Antonio Pigafetta, the chronicler of Magellan's epic voyage around the world, called this region Calagam or Calagan. Calagan was among the three choices for Ferdinand Magellan to dock for provisions and trade. "Magellan was anxious to resume his voyage and inquired which were the best ports for provisions and trade, wishing to turn of his many articles of barter into gold and spices. He was told that there were three - Ceylon (Leyte), Zzubu (Cebu) and Calagan, but that Zzubu was the largest and had the most traffic." March 31, 1521 - The celebrated "Primera Misa", an Eastern Sunday Mass, was held in the Philippine Territory on the order of Ferdinand Magellan. Two of its prominent attendees were the Butuan brother kings: Rajah Kolambu of Butuan and Rajah Siagu of Calagan. January 25, 1571 - Garcia Sierras Chacon were appointed to rule the district of Surigao and Parasao (Cantilan), an encomienda. 1574 - Andres Mirandaola wrote to King Felipe II of Spain that "much gold is found in the island of Mindanao, in the district of Butuan, Curigao (Surigao) and Parasao (Palasao). Much gold is mined there." 1609 - The conquistadores arrived in Tandag and constructed a stonefort (a militray garrison) to strengthen their conquest of the locals. This caused the Northeastern portion of Mindanao to be raised to the status of a province. This "distrito" was called "Provincia de Caraga" with Tandag as the capital. 1622 - The systematic evangelization of Caraga Province began with the arrival of eight Recoletos from Manila. They arrived in Tandag and branched out to outstations in the districts, namely: Butuan, Surigao, Dinagat, Gigaquit, Numancia, Calagdan (Cantilan), Iranza and Bislig. They were headed by their Superior Fray Miguel de Sta. Maria, OAR. 1622 - According to Erectio Conventum In Insuli Philippinis, the pueblos of Calagdan and Parasao (Palasao) were listed having 700 to 800 Christian families. 1626 - The Recollect chapter of 1626 appointed Fray Juan de Nicolas as priory of Tandag. Calagdan was among the priories that year. On the same year, 6 more priories was established: Bacuag, Tandag, Gigaquit, Butuan, Calagdan, and Dinagat. 1629 - Calagdan disappeared from the list of residential stations. 1700 - Two Spanish soldiers from the fort of Tandag was assigned at Parasao and Calagdan, namely Antonio Garcia and Cristobal Moreno, respectively. 1740 - A map made by Italian mapmaker Giambattista Albrizzi in Venice, Italy mentioned the northern part of Mindanao as "Manobos". Described as a place near the ocean and a rivermouth. 1750 - A census copy now on display in a museum in London mentioned the two pueblos of Calagdan (Calagda-an) and Bayuyo (now the present-day Union). 1752 - Bayuyo, I. St.Jean (an island near Bayuyo ), I. De General and Bucas are mentioned in a map made by French Cartographer Jacques Nicolas Bellin. 1752 - Moro raiders attacked and burned the two barrios of Bayuyo and Calagdan. 1761 - A concentrated resettlement of Calagdan, Palasao and Bayuyo in one place had been realized. The place is located across the river later named as Cantilang. 1767 - Padre Fray Valero de San Agustin, visited Calagdaan (Cantilang) and established a northern outstation outside Tandag. 1767 - The Moro pirates attacked Tandag Fort in 1758, 1761, 1767. But of all these attacks, the worst casualties suffered by the Moros was in 1767 when Fray Valero de San Agustin brought a reinforcement of 200 Calagdaan (Cantilan) fighters led by valiant warriors Francisco Arreza and Santiago Arizobal. They rode on seven sailboats to Tandag. After the fierce battle, many Moros were killed and several of their boats were sunk on Tandag river and sea. 1782 - More people from Calagdan were moved to the new town in Cantilang. 1790 - Recoleto Padre Fray Francisco Andres de Basilio, assigned to administer the pueblo of Cantilang recorded a population at around 2,000 people. 1791 - The Recollects established Cantilang as a mission under the advocacy of Immaculada Concepcion. present day San Miguel in the southwest. 1806 - Fray Miguel de los Arcos completed the construction of the "Cota" better known as Baluarte de Señor San Miguel. 1834 - Recoleto Padre Fray Francisco Villas de San Lorenzo listed Cantilan’s population at 3,278. October 14, 1856 - A hurricane from the north that bring huge tidal waves changed the whole town into a sea. October 16, 1856 - Cantilan became a wasteland but not obliterated from the memories of the people. Then the survivors crossed the Cantilan river to the northeast and northwest forming the present districts of Linintian and Magosilom of the modern Cantilan. 1856 - Fr. Modesto Marzo y Casabana founded the new Cantilan across the river along with other survivors. 1857 - Fr. Marzo concentrated on the improvement of the new town. Spearheaded the town zoning. 1859 - A detailed map of the Philippines by Joseph Hutchins Colton in New York mentioned "Bayuyo" without Calagdan. 1871 - The Recollects ceded spiritual administration to the Jesuits in Surigao including Cantilan Parish. 1889 - Cantilan's church was reported to be most beautiful in the entire east coast of Mindanao. 1898 - Cantilan's population reached 10,026. 1899 - Cantilan's population increased to 10, 576. February 10, 1899 - A neutral government was declared in Cantilan known as the "Andorran Government" during the time of Fr. Romualdo Moral, OSB who took charge of the parish in 1879, Fr. Ricardo Romero and Gobernadorcillo, Vicente Buniel. 1901 - Cipriano Sering was appointed as Justice of the peace. He was the first Justice of the Peace of Cantilan. September 1902 - John Crockett Edwards and his wife Snowdie B. Edwards later joined George H. Bohner in Cantilan. The three were among the 1,074 American teachers sent by the United States government to the Philippines between 1901 and 1902 via the USAT Thomas. All of them did not stay longer in Cantilan. On October the same year, Mr. and Mrs. Edwards was transferred to Bohol while Mr.Bohner to Cabadbaran. 1903 - After a couple of months since the arrival of the American school teachers, they left Cantilan for a certain reason but returned shortly with the addition of a new teacher in the person of Mr. Clayton R. Wise. 1905 - A night school maintained by American teachers was established in Cantilan. 1906 – Ralph McCulloch, supervising teacher for Cantilan while Zoilo Guazon took care of Barrio school in Lanuza. 1906 - William K. Hotchkiss was appointed as Teacher under the Bureau of Educationin Cantilan on November 17, 1906 with annual compensation of P3,200 . 1908 - MSC (Missionaries of the Sacred heart of Jesus) Priests arrived in Cantilan. They first to arrive were Fathers Joseph Menken and Anthony van den Bogaard. 1909 - Records show 11 school teachers where assigned in Cantilan headed by an American supervisor. 1915 - MSC priests founded St. Michael’s College. 1915 - A Catholic Priest in Cantilan was fined P6.00 for ringing bell too frequently. 1918 - Cantilan's population reached 18, 594; 9,201 of which were males and 9,393 are females. 1922 - Telegraph office was established in Cantilan. 1926 - Construction of Carrascal-Cantilan-Lanuza road was approved in 1926 with a total appropriated budget of P10,000.00. 1930 - Francisco C. Alas was appointed as postmaster for Cantilan post having a monthly compensation of P840. Among the first in the region. 1933 - Virgilio Floresca, known among the first english poets in the Philippines wrote his famous poem "And Ovid Sand" in his nipa house in Sitio Domoyog, Cantilan. Floresca was a teacher at St.Michael's College when he met Juanita Almeda which later became his wife. 1943 - During World Ward II, a guerilla network station was established in Cantilan under the command of Colonel Fertig. The intelligence network and organizing military commands is only established within the areas when there is a heavy presence of guerrilla activity. October 4, 1944 - A radio network was established in Cantilan during the war. The network was among those with direct contact to MacArthur's headquarters in Australia. 1948 - Cantilan has its first taste of electric lights on this year after Ismael Yusico put up Yusico Electric. He bought a surplus power generator from the US Army based in Giuian, Samar. The electric consumers were provided connections at a flat rate of P6.00 per 25watts bulb from 6PM to 6AM. 1970's - According to EVE, "Charles Lindbergh arrived in Cantilan incognito..." and was accompanied by former Assemblyman of the lone district of Surigao del Sur Jose "Popit" Puyat. He came to Cantilan sometime in 1970′s to observe the vanishing monkey-eating eagle at SUDECOR bird sanctuary. 1980 - The first history book for Cantilan written by former councilor Eulogio V. Eleazar was published through a municipal resolution giving the author a little amount to finance the project. 1982 - Cantilan celebrated its bicentennial fete. Surigao Across the Years by Fernando A. Almeda, Jr.